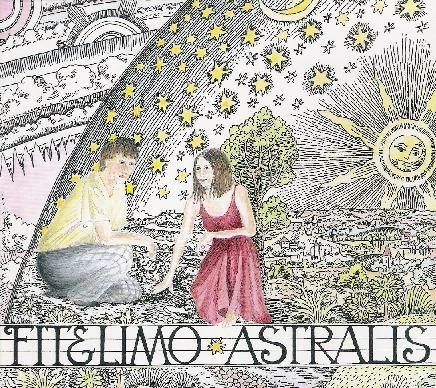 Fit & Limo - "Astralis"
From one album to the next, the German duo Fit & Limo continue to impress me as one of the most fresh and exciting psychedelic bands around. Part of what makes the music so captivating is the instrumentation and the duo's skillful use of it. Check out this list - guitars, mandolin, sitar, bouzouki, banjo, dulcimer, gopichand, bass, violin, autoharp, harmonium, piano, mellotron, chamberlin, organ, recorder, whistle, melodica, shenai, clarinet, kazoo, glockenspiel, drums, percussion, jew's harp, musical box….. wow!! The music is based in folk-psych/wyrd-folk, though Fit & Limo are on the progressive cutting edge of these genres. We've got beautiful flowing songs like "Dem Neuen Jahr", with its sitar, drones, mellotron, flutes, percussion and vocals. The dramatic yet seductive and somewhat theatrical intensity of "Drift Away". The gorgeous assemblage of stringed and wind instruments and percussion on "The Lovers". Only Fit & Limo could make the banjo sound trippy, as evidenced by "Wind Whispers". I love the segment with the banjo and recorders. There's the prog inspired west coast flower power psychedelia of "Sweet Imagination" and "Around the Fount". The Celtic influenced psychedelic "The Moon Shines Bright". "The Snow It Melts Soonest" features a psychedelic take on traditional folk music. I love the fiery acidic majesty of "Chinese Firebird". And the mellotron drenched prog-folk of "Perlenglanz". 18 enchanting songs in all. And not just a little bewitching. Absolutely essential for anyone into folk-psych. These folks are true adventurers. For more information you can visit the September Gurls web site at: http://www.septembergurlsrecords.com.